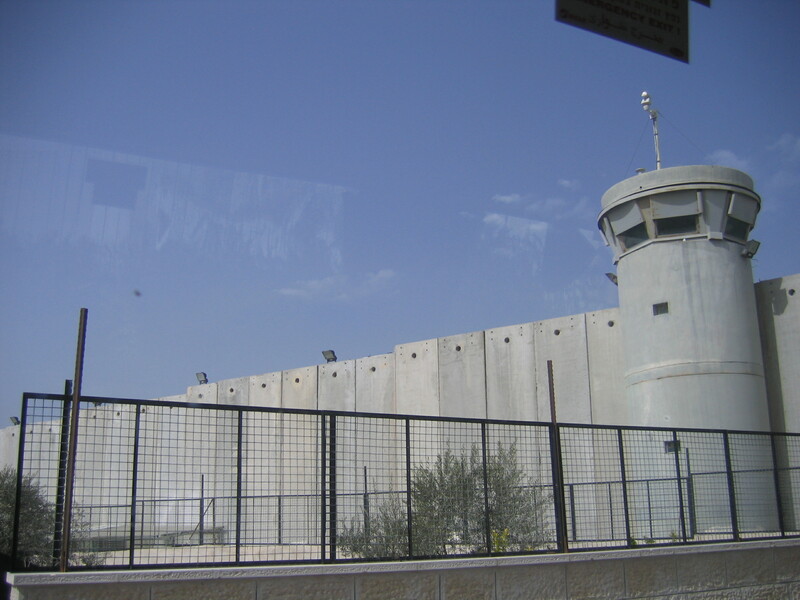 Our final day in the Holy Land was spent beyond Israel’s borders, as it were, in the Palestinian Authority area including Bethlehem – just a few minutes from Jerusalem. The wall reminds me of the border between San Diego and Tijuana, though the crossing was a lot smaller. There is a distinctive difference from Israeli to Palestinian controlled territory, but not nearly as dramatic (in terms of poverty and plenty) as the Mexican to American transition. Instead of kippot, you see keffiyet. 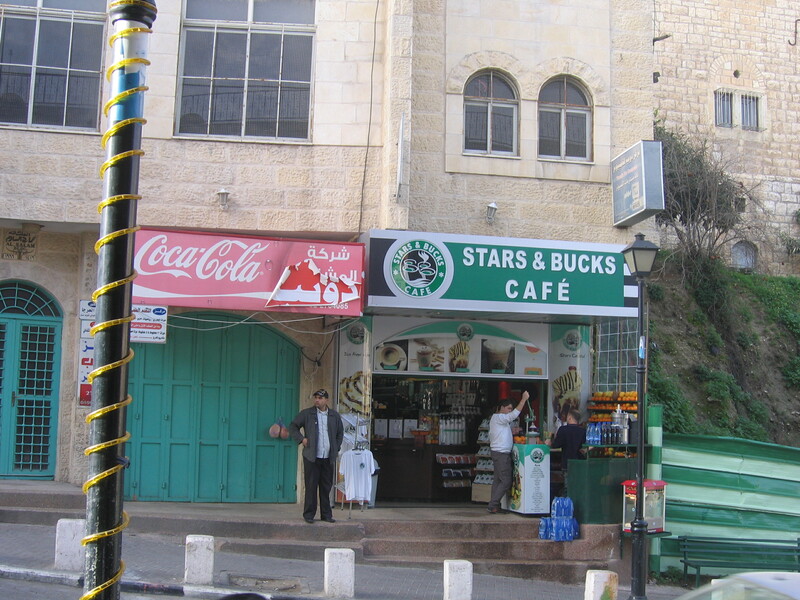 The Arabic signs are more prominent, but English and Hebrew are still present. Ezra, our driver, and Yitzik, our guide, being Israeli citizens are not allowed to cross the border, so we had a new driver and picked up a new guide once on the other side. We spent the better part of the morning at the Church of the Nativity, and then walking through the streets to the Church of the Theotokos, or as it is more commonly called, the Milk Grotto. We paused to view shepherd’s field, which upended my lifelong mental image of the shepherds on a hill top and the little town of Bethlehem in the valley below – it is actually the other way around. Villages are built up along the hillside to leave the valleys clear for farming and grazing. Like so many of the holy sites, the Nativity church is shared/divided among Catholic (Roman/Latin, Franciscan) custodians, Greek Orthodox, and Armenian Orthodox. 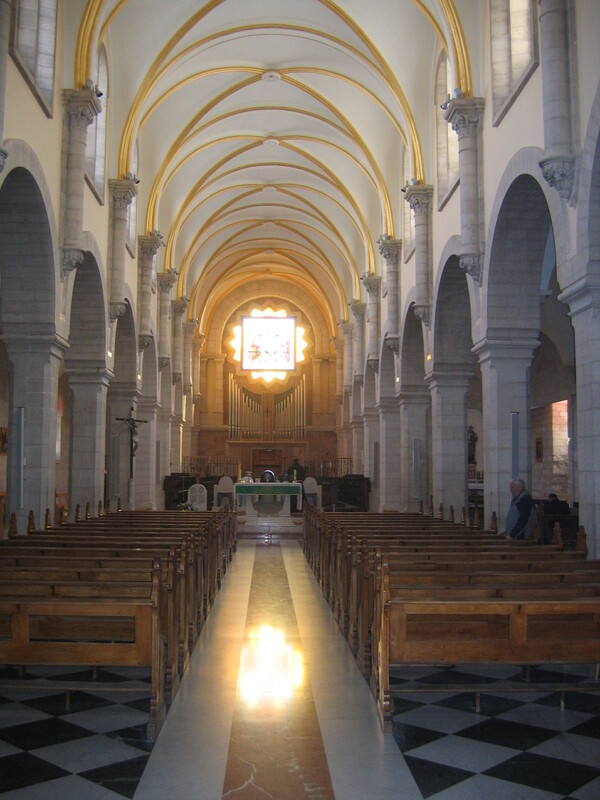 The main basilica is shared by the Orthodox churches, and the adjacent church of St. Catherine is catholic. The former is ancient, dirty, dusky, and dark. The latter is bright, well-lit, and modern. The original mosaics of the basilica are still present in some degree, though so covered in grime as to be virtually unrecognizable. The contrast is striking, and only a happy medium would be an improvement. 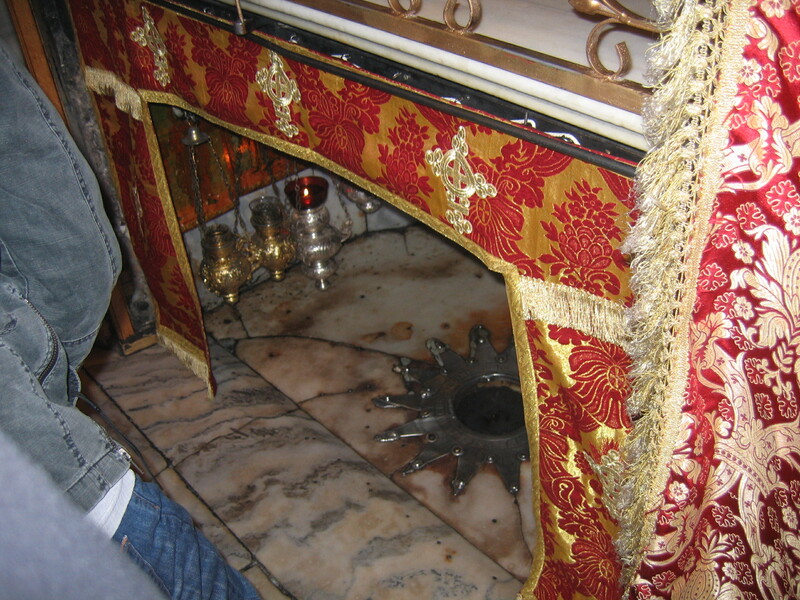 The Cave of the Nativity is small, located below the main altar in the Orhtodox section, with some of it accessible from the Catholic side –including St. Jerome’s living space of the last quarter century of his life- though the traditional site venerated as the place of Christ’s birth is on the Orthodox side. The Milk Grotto is one of those sites that at first glance, I had to cringe. 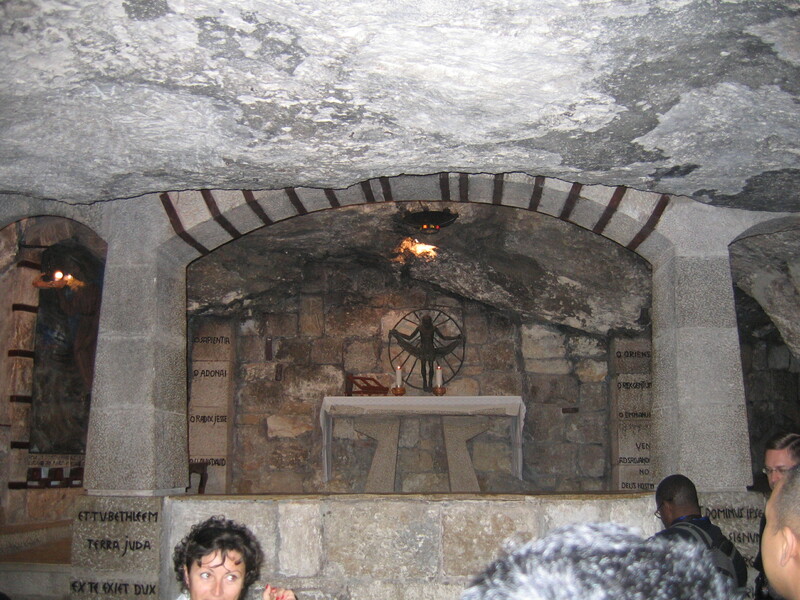 This was a place where Mary fed Jesus? Did George Washington sleep here too? Give the faithful some credit! …But, even cynical prayers are answered. The Franciscan custodian inside the grotto volunteered to give us a brief synopsis of the church – historical arguments and pius myth both included. 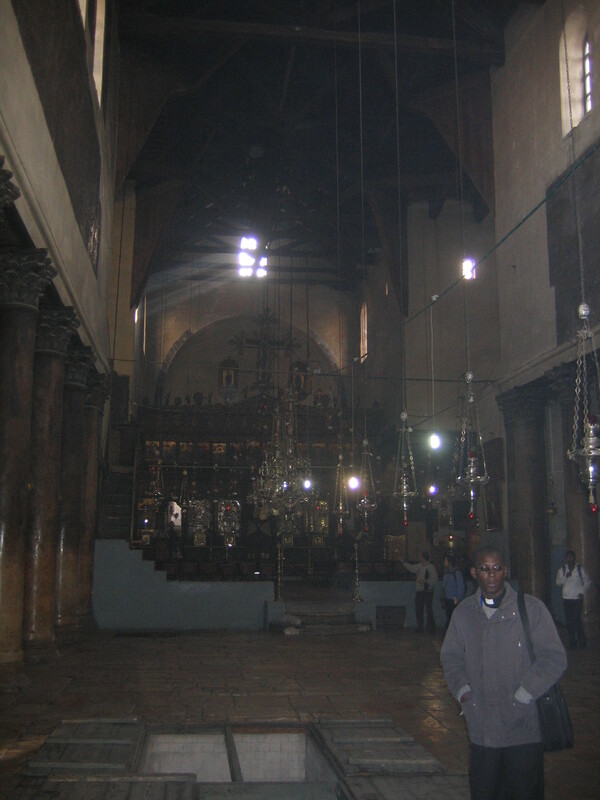 Apparently, when St. Helena made her state visit to Bethlehem, the local Christians showed her two places – the cave of the Nativity, and the site of Joseph’s house in Bethlehem, where the Holy Family lived until ordered into flight to Egypt, and where the Magi are supposed to have visited. The “milk grotto” story developed from the idea that in one of her feedings, the Blessed Mother spilt two drops of her milk to the stone, which immediately turned white. Powder taken from these stones, when imbibed, is supposed to heal any reproductive ailments a woman might have, and is a very popular devotional/sacramental in some parts of the world. That the church is one of the oldest sites dedicated to Mary as Mother and to include Joseph, the poor man, is what makes it most worthy of veneration. By A.J. Boyd in Holy Land on February 13, 2010 .